Give your horse the advantage of a pain-free performance. Tackle your next competition with Subside on board. 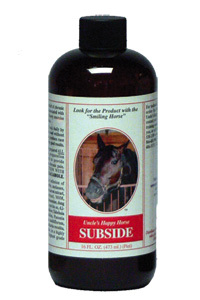 Subside is an oral all natural daily pain reliever that is especially helpful in horses with arthritic joints and/or sore inflamed soft tissue. Subside is really doing a great job in eliminating painful inflammation in performance horses and race horses. Where arthritic changes and the consequences of such are a major factor, Subside is having a major pronounced positive impact. Horses perform better because it is easier to do well pain-and-inflammation-free. Subside promotes pain-free performance. calms inflamed soft tissue areas that hurt. Subside works quickly, effectively, and affordably. Don’t use those products that get you in trouble. Use products that work naturally! We recommend that you administer Subside at one oz per day and with race horses, double up on race day. It also helps dressage horses and jumpers, barrel horses and pleasure horses. Many horses, particularly older horses or those engaged in competition, suffer the normal and natural wear and tear effects arising from competiton and repetitive bone stress. Subside provides pain relief to joints and inflamed soft tissue areas that hurt. Subside should be administered daily. It is exteremely palatable, very affordable, and will never test. It can be given up to and on the day of competition. Ingredients: An infusion of essential oils and herbs, honey, apple juice, pure sour cherry extract, arnica oil, barley grass, barley grass oil, boswellia, boswellia oil, burdock root powder, burdock oil, black pepper oil (Camden Grey), bushy knotweed powder. cat's claw bark powder, celery seed powder, chamomile, chamomile oil, chondroitin, collagen II, comfrey root powder, corydalis, devil's claw, dong quai root powder, drynaria, feverfew, FoTi, glucosamine, gotu kola, guduchi, hyssop oil, kaishore guggulu, kava kava, kava kava oil, kelp, lemon balm leaf, lemon balm oil, meadowsweet, mistletoe, MSM, myrrh gum, myrrh oil, nutmeg, oil of nutmeg, pau d'arco bark powder, pau d'arco oil, red peony, shark cartilage, St. Paul's wort, suma root powder, suma pfaffia oil, white willow bark, in a highly refined solution of highest grade colloidal silver. “Thanks to Subside. Master Kevin who fractured his p1 coming out of the third turn at Scioto Downs, left us with two options: operate or put him down. Thanks to Dr. Alicia Bertone of Ohio State Vet Hospital, with 5 screws his fracture fused back perfectly, but racing was out of the question for fear arthritis would be too severe.